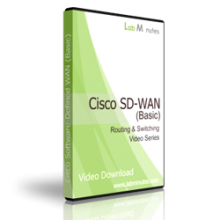 This video bundle features a complete video download set for Cisco Software Defined WAN (Basic). With over 11 hours of lab video tutorial, you will be able to get up to speed and become more familiar with the technologies. Buy this video bundle and view them locally ad-free on your computer at your own pace without internet connection, and get a saving over 12%. This video bundle helps you lay a foundation to Cisco SD-WAN (Viptela) technology. The video series begins by providing you with the fundamental of Cisco SD-WAN before walking you through installations of all the key components including the controllers (vManage, vBond, vSmart) and assorted type of WAN Edge routers (ISR4K, vEdge, vEdge Cloud). You will learn how to configure devices using templates. By the end of the video series, you will have basic routing and connectivity established over your SD-WAN overlay ready to pass traffic. The next generation WAN is here so do not miss out this learning opportunity. Please note that videos on more advanced SD-WAN topics are available in a separate video bundle. This video bundle will be eligible for any future video releases that are considered basic (under our 60-day policy), and NOT eligible for any videos released under the Cisco SD-WAN (Advanced) video bundle.